This book is a must-have for every bride and groom to be! 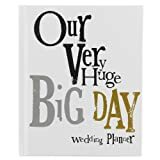 This entry was posted in Wedding Store and tagged Huge, Planner, Very, Wedding by Formal Affair. Bookmark the permalink.